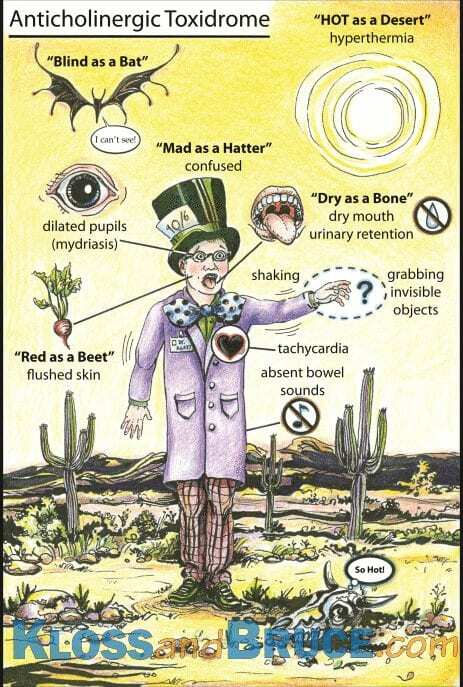 Anticholinergic Toxidrome was one of the first flashcards I designed. I wanted to make a play on the old mnemonic: mad as a hatter, hot as hell, red as a beat, dry as a bone, and blind as a bat. I thought of the opening scene from Fear and Loathing in Las Vegas, where Raul Duke and his attorney Dr. Gonzo are speeding through the desert and are attacked by bats… ‘somewhere around Barstow‘. This inspired the first two elements, the desert and the bat. I added the cow skull, so frequently seen in Southwestern motifs here in the US. The original drawing featured me wearing a cat in the hat styled hat, but Travis saw fit to change this to the hat worn by the hatter in Alice in Wonderland.